Well Mr. Conner - Thanks you for giving me the opportunity to consult with you in regards to your writing material. I would like to personally compliment you on your work. 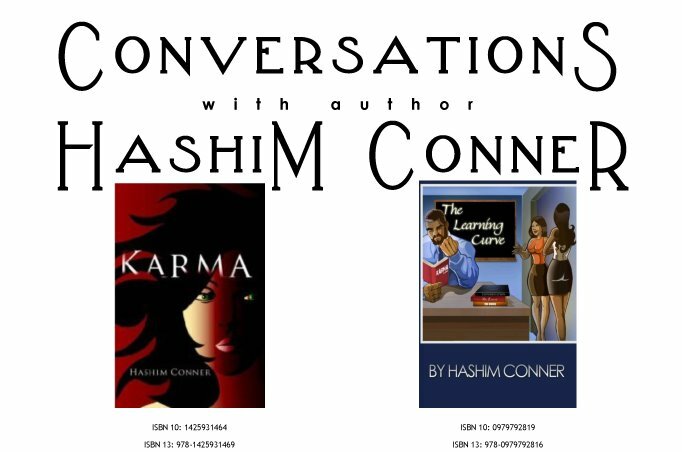 While both Karma and The Learning Curve was an easy read, the title along with the plot versus the ending along with the hidden surprises, threw me for a loop. Especially in the way you ended Karma. However, my questions would lead up to that is due time. Initially I would like to get a little insight on the logic behind your material (your writing). So my first question may seem pretty simple. Based on the plot of the story in Karma, Chris grew up in Detroit and was rapidly surrounded by the sexual attraction amongst boys and girls in high school. Based on this plot, I immediately assumed that your expected or potential audience, as far as readings, was aiming towards the mid to late teens age range. Is my assumption right? Did you ever consider your style of writing based off of your potential readers (your audience)? Well first I would like to thank you for the opportunity to have this dialogue and second I want to thank you for your support, I truly appreciate the love. I also want to thank you for a great question, one of many I'm sure. To answer the question, I would have to say that when I first started writing Karma I didn't take into consideration my target audience. To be totally honest I didn't know what I was going to do with it so a target audience was the least of my worries. I wrote for myself in the beginning, but as the story grew and came together I began to ponder who the story was for especially as I drew closer to the end. By the time I was finished with Karma I had a firm belief that anyone from the age of 18 to the age 35 would be able to enjoy this book. The reasoning behind this was simple. People from the ages of 18-25 could possible relate to Christopher Alexander's high school and college years because they were dealing with or had recently dealt with some of the same things he was dealing with. Individuals 25-28 were less than ten years removed from those high school and college years so they could also relate. Everyone 30 and over could look back and reminisce about their college years and enjoy the book from that regard. And all of the above would be able to relate to relationships that had gone array in there lives. This is true. Me being my age - Although I made a quick assumption on who you were writing for, I was still able to related and look back at the situation I was involved in during high school. It brought back some interesting memories. LOL. Made me think about who, at the time, was the love of my life, all that I went through with this person, and in the end who I ended up with or how things had changed. With this being said, Maria and Chris had a connection from the very beginning of the story. Half way through, again I assumed, that the entire book was going to be built around the two of them. Based on the way you dragged their relationship out, I assumed that karma was going to be based on a twist in their relationship in the end. But it wasn't. What was your purpose in keeping Maria around for so long after they went off to College? With all of the chances you had to eliminate Maria from the story, why did you use Andrea? Well to be honest I wouldn't necessarily say that Maria dragged on, I believe I was showing how Christopher's maturity level wasn't there yet, because a more mature person in that situation would have known when to let the relationship go. A more mature person would have been able to let it go and move on, but because Christopher and even Maria at that point hadn't matured. They allowed a good friendship to go to waste because they (mostly him) didn't know when to break it off. Plus Maria was one of the few serious relationships that you could actually say Christopher had during the entire book. As far as Andrea went I can't honestly say Christopher used her as much as I can say they used each other. It was more of a good time then it was anything else. Also - there was a few instances where you appeared like you was going to give Maria a little more excitement in your writing. Why did you keep your focus and attention directly of Christopher? And even then - there was certain areas of the book with Christopher that you stopped short on emphasizing on. Why? Well to actually touch on a statement that you made "What struck me odd was- What was the likelihood of a man being that smooth with his game." I am a firm believer that there are no better or worse cheaters on the planet. A lot of people believe that women are better than men at cheating than men. I would be better suited in agreeing that women more than likely to get caught. With that said I won't get too far off track. Also - I must compliment you on Christopher's character. While Christopher was primarily a ordinary dude growing up with normal everyday teenage high school issue - You manage to keep him away from the typical stereo type issues of drugs, gang activity, violence, etc. Why did you take the cleaner route of his character? Was is because of your knowledge of these negative activities being limited? Or simple because you wanted Christopher's character to stay somewhat positive. After all - other than his love for women - overall, Christopher was a very respectful man. Very subtle. Confident. Goal Driven. And while he did what he did with many women, for the most part, he still gave them a level of respect. It seems like in today's world every time you turn on the television, the radio, or even pick up a book you get bombarded with teenagers, or young inner city youth with the same problems. Drugs, gang activity, and violence. We rarely get a glimpse of these people any other way. It's no way you can convince me that there aren't any kids who haven't made it through high school without doing drugs or shooting each other up. So I thought I would write a character from that perspective. And at the same time show that just because the character is not involved in that sort of drama the story can still be interesting. And to answer the second part of the question it wasn't because of limited knowledge of those points, unfortunately I knew all three of them all too well. Though I have never myself been involved in any gang activity, nor have I ever used any drugs it doesn't mean that people close to me weren't involved with those things. I just wanted to give inner city youth a break from the character roles we seem to all TOO normally take in television, music, and books these days.